Unlike other normal aquarium kits, a Glofish tank needs to acquire some specific equipment for bringing out the beauty of Glofish, especially the LED lighting system. 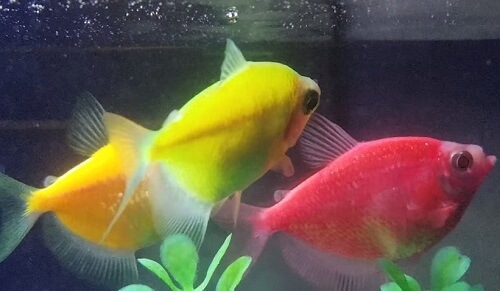 Glofish need high-energy lighting (highest is blue light) to emit less energy one (fluorescent light). Decorations used for a Glofish aquarium should be able to well reflect the light shining on them. 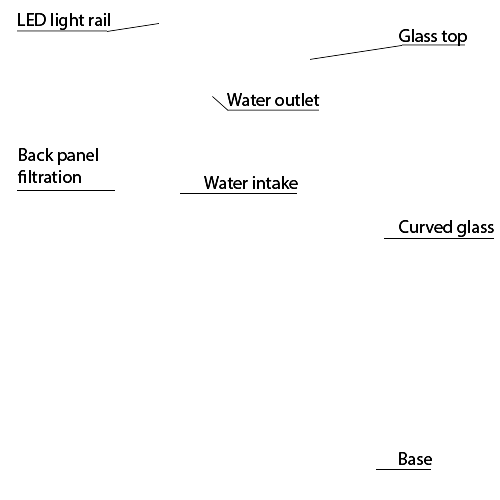 Based on these facts, some aquarium kits that you can use to set up a Glofish tank are carefully chosen in the following reviews. Filter media: Marineland Rite-Size Z Cartridge and Bio-Foam. 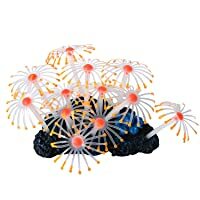 Although this aquarium kit isn’t intended for any specific type of fish, I think it will work well for Glofish. The curved front glass of the tank offers a sleek and unobstructed view that allows you to enjoy your fish from any angles in the front. 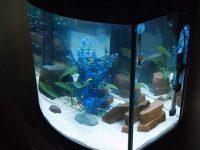 The curved glass distorts everything inside the tank and makes them look a bit bigger when viewed from the front corners. 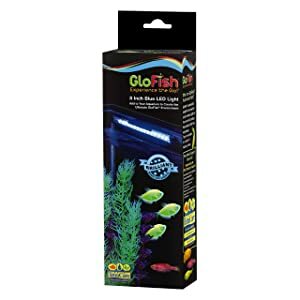 This will enhance the shimmering lighting effect of Glofish and glowing decorations inside the tank. 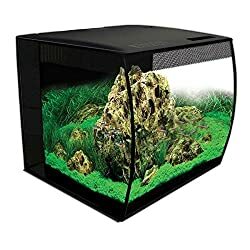 The unique glass canopy which can slide to the back of the tank is for easy access to the inside for feeding your Glofish and maintenance. The glass canopy also protects the light above from the steam from the tank for expanding its lifetime. The LED light rail hang-on the back panel of the tank provides two lighting modes with daylight and moonlight. While daylight is necessary for normal activities of the fish during the daytime, the relaxing blue moonlight is ideal for Glofish to glow whenever you want. 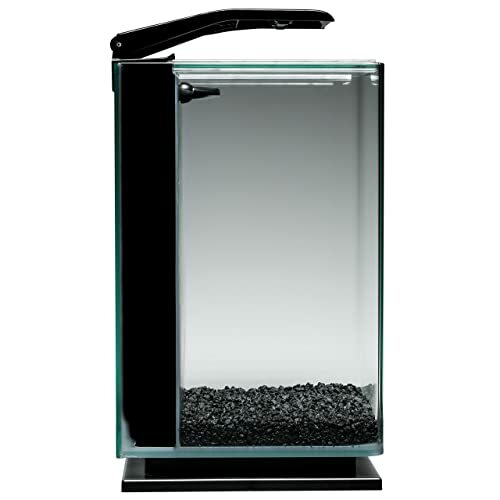 The Marineland Portrait aquarium kit is fitted with a panel filtration system in its inside back. The system is very efficient to keep the water clear and clean for a long time with appropriate maintenance. It includes a water pump and filter media. The pump circulates the water in the tank. When the water flows through the filter media, they are filtered. You can put a huge amount of different types of filter media in the back panel to build an efficient multi-stage filtration for your Glofish. The kit also comes included with filter media, bio-foam for mechanical and biological filtration and Marineland Rite-Size Z cartridge for mechanical and chemical filtration. 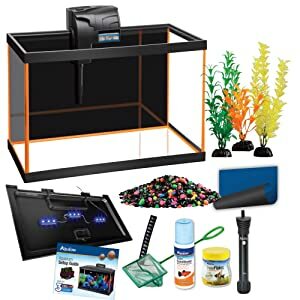 The kit comes with most things needed for a Glofish tank setup. The black color of the back panel filtration system highlights the fluorescent light from Glofish and you don’t need to buy an extra dark backdrop. 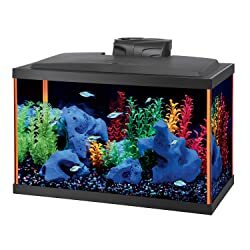 You only need to buy a small aquarium heater to maintain the temperatures at 78 degrees Fahrenheit for Glofish and some decorations to fulfill the setup. 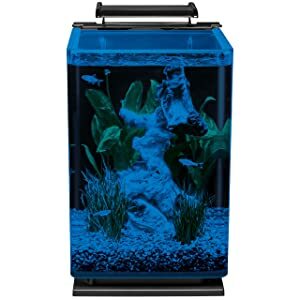 This is a very beautiful 15 gallon fish tank that you can use to keep Glofish. 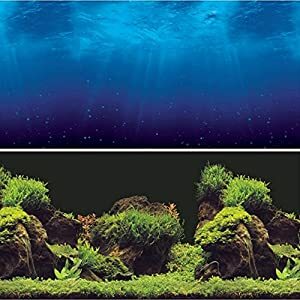 Its front glass panel is vertically curved that makes a feel that your Glofish, decorations, and plants look a bit bigger when enjoying them from the front. This is precisely what you will need to bring out the best beauty of Glofish. 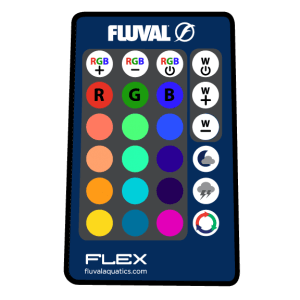 The best thing when choosing this kit for Glofish is that its LED lighting system offers numerous color options. There are total twelve preset colors including pink, blue, yellow, green, orange… that are ready to use with only a single click on the remote control. Could you imagine how beautiful your Glofish is under different lighting colors provided by this LED lighting system? I only know it will be a great experience. Moreover, you can freely customize three color channels (Red, Green, and Blue) to build the most beautiful colors as you think. There is also an automatic lighting cycle for freehand control and two preset weather modes ready to use on the remote control. The tank also uses a back panel filtration system like the previous tank and the working mechanism is the same. The pump circulates the water and makes it filtered by the filter media in the middle compartment. 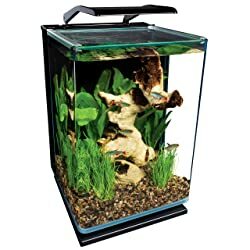 You can place a large amount of filter media in this type of filtration system for better water filtration and your fish healthy. Others: dark background, gravel, tropical flake, conditioner, fish net, setup guide. The Aqueon NeonGlow 10 gallon comes as a complete kit with all necessary equipment and supplies that you will need to start your first Glofish aquarium. The main tank is a 10 gallon glass aquarium. It is sealed with orange colored epoxy resin for brighter and better appearance. The tank is well constructed for a durable appearance and many years of enjoyment. The black plastic hood is pre-cut with some holes for positioning a Hang-On-Back filter and heater in the back and feeding your fish in the front hole. 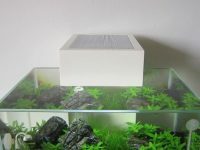 It is very easy to open the lid to access inside the aquarium for easy setup and maintenance. There are three LED light rails under the hood to provide blue light for Glofish. The Quiet flow 10 LED Pro filter is very quiet and you don’t have to worry about the noise produced. It uses a filter cartridge and its internal system to purify the water through multi steps to keep your fish healthy. 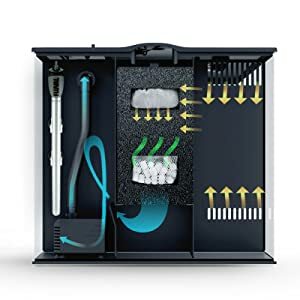 The filter features an LED indicator on its top that is able to monitor actual water levels to know when the filter cartridge is clogged and need to be changed. So, you don’t have to worry about forgetting to change the filter cartridge that is not good for your fish health. An aquarium heater and a stick-on thermometer are also included to keep the water temperature at a constant range around 78 degrees Fahrenheit for Glofish. Some colorful gravel, plastic plants and a black background included are ideal for establishing a Glofish aquarium. Additives: AquaSafe sachet, TetraMin sachet, TetraCare brochure, digital thermometer, fish net. This kit is specially intended for a Glofish tank setup. 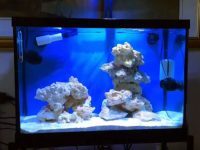 The main tank is a 20 gallon glass tank. 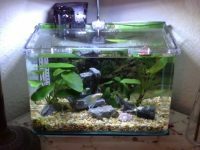 20-gallon is the tank size recommended for starter hobbyists because it is large enough to keep many types of fish happy and healthy in the tank. This tank is large enough to accommodate different types of Glofish including zebrafish, tetra (gymnocorymbus ternetzi), and tiger barb (puntius tetrazona). The blue LED light, black gravel with fluorescent accents, and some Glofish decorations are included to give GloFish an exciting fluorescent look. Under the blue LED lighting, these special ornaments are able to brighten up entire the tank that will highlight and supplement the fluorescent light from Glofish. The kit comes with a Tetra Whisper 20 power filter, heater, digital thermometer to keep Glofish healthy. Some aquarium supplies such as AquaSafe sachet, TetraMin sachet, fish net are also included. 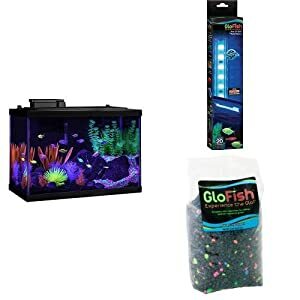 As you see, it comes with almost essential supplies for Glofish, so you don’t need to buy these items separately. Setting up a fish tank for Glofish is the same as what you do for a normal tropical freshwater aquarium. If you are new to the fish keeping hobby, read the full guide here. You will need to make the tank cycled before adding the first Glofish to not sacrifice any of them. In this article, I only mention some specific things you have to choose for creating a beautiful Glofish aquarium. Fluorescence is the emission of light by a substance that has absorbed light or other electromagnetic radiation. It is a form of luminescence. In most cases, the emitted light has a longer wavelength, and therefore lower energy, than the absorbed radiation – Wikipedia. Basing on this fact, you will need to supply high-energy lighting (highest is blue light in the visible color spectrum) for Glofish to emit their less energy fluorescent light. If your aquarium doesn’t come with a blue light, you need to buy one. 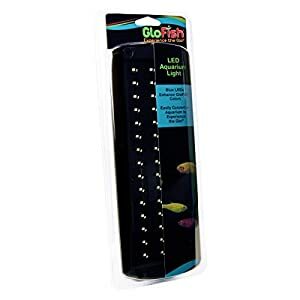 Previous are some blue LED lights specially designed for Glofish. The Glofish aquarium gravel is the best choice for any Glofish tanks. You should also add some more glowing ornaments to make the tank more attracting. 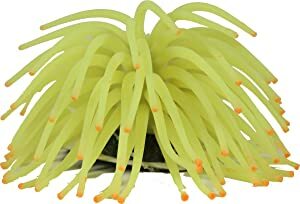 When choosing decorations for a Glofish aquarium, you have to be sure that these things could glow by themselves, and thus highlighting and supporting the light from Glofish. 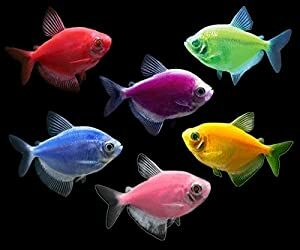 There are many colorful decorations for Glofish that you can buy and mix them to any color combination that you would like. Having a dark aquarium background helps to strengthen the fluorescent lighting from Glofish. Glofish in a tank with a black background will look so great even in the daytime. 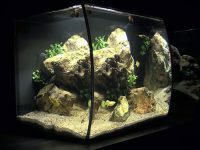 If your aquarium doesn’t feature a black back-panel filtration system or backdrop, you should buy a black background or place the tank against a black wall. 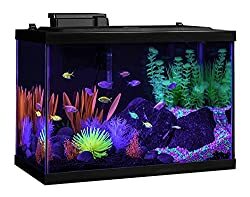 With a black background, when viewing your Glofish tank from a far distance in the dark, it makes the feel that there is nothing there but a few glowing decorations and colorful fish. You should think about buying Glofish finally after the tank is completely cycled and ready for stocking fish. There are many colors for you to choose from such as pink, yellow, red, green… zebrafish, black tetra, and tiger barb Glofish are the most popular Glofish types which are easy to care for. Carefully choosing the most beautiful fish but make sure they are healthy. 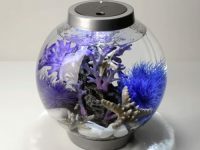 You should also acclimate the new-buying fish to your aquarium in the proper way to protect them from stress and death. Because Glofish are tropical fish, they need to be cared for as other tropical fish.